This past Tuesday afternoon I was working with clients at the office of Quantum Networks, an online retailer of wireless products and technology incubator. 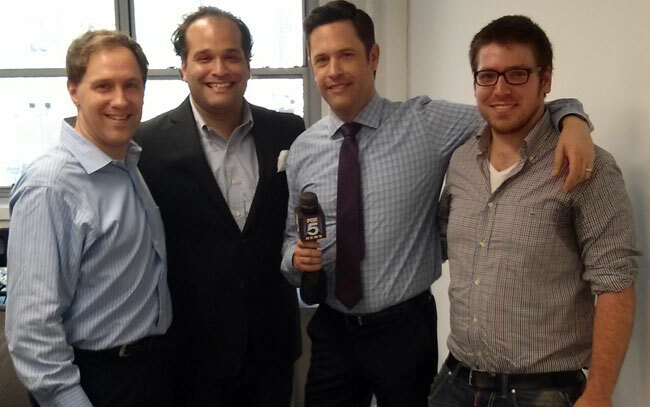 Joel Waldman of Fox 5 NY News was there doing a story about social media and interviewing two good friends of mine – Ari Zoldan (CEO and serial entrepreneur) and Eli Bobo (search engine optimization guru). It was fun to meet Joel and the crew – and I inadvertently made an unexpected appearance on television too! Prior to arriving at Quantum’s midtown location (the headquarters of their wireless products store), Joel had been “begging” pedestrians on midtown Manhattan streets to follow him on Twitter @JoelWaldmanFOX5. It’s the beginning of a most amusing news segment about how to engage (or perhaps how not to engage) in social media campaigns. If you’ve never spent time in New York City, I’m sure you’ll get a good laugh out of seeing what it’s like trying to grab the attention of local commuters near the Port Authority Bus Terminal. After Ari Zoldan provided his insight that social media efforts are all about execution, tech expert Eli Bobo stepped in to provide an enhanced insight on increasing online presence using social networks. While I thought I was well out of the camera’s field of view, there I am in the background, caught like a smirking deer in the headlights. 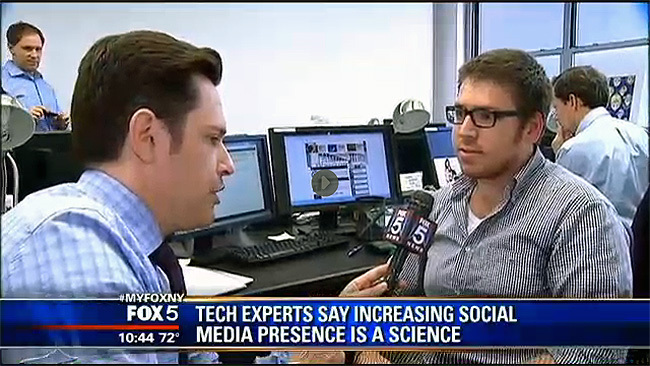 You can see the entire “Begging for Followers” Fox 5 New York video on the MyFoxNy.com website. In the past, I’ve presented at numerous different continuing legal education (CLE) seminars on social media and the law. Internet law, user generated content sites, online communities and social networks have been a passion of mine for almost two decades. But much of what I know is from the good fortune of being around many knowledgeable friends who are generous with their time. I’ve been at the Quantum offices several times and had the pleasure of having several excellent high level conversations with Eli about Google’s Panda and Penguin algorithms, how the company takes strategic measures to deal with changes that Google implements periodically as well as the continued importance of social media. After the interview was over, the group had an enjoyable conversation about Facebook, Twitter, the other Michael Wechsler (director of the excellent movie, “The Red Robin”) and the need for good health benefits (and workers’ compensation) if you’re a roving television cameraman. Leave it to an attorney to think of legal remedies to combat on-the-job back pain. (Thinking about how every situation could involve personal injury law becomes second nature from the moment one finishes law school.) After Joel left us to get back to business, I decided to have mercy on his soul and am now a follower of his on Twitter. Perhaps you can do the same!